What is the CEILING.MATH Function? The CEILING.MATH Function is categorized under Math and Trigonometry functionsFunctionsList of the most important Excel functions for financial analysts. This cheat sheet covers 100s of functions that are critical to know as an Excel analyst. it will return a number that is rounded up to the nearest integer or multiple of significance. The function was introduced in MS Excel 2013. As a financial analystFinancial Analyst Job DescriptionSee a real Financial Analyst Job Description including all the skills, experience, and education required to be the successful candidate for the job. Perform financial forecasting, reporting, and operational metrics tracking, analyze financial data, create financial models, we can use the CEILING.MATH function in setting the pricing after currency conversion, discounts, etc. When preparing financial models, it helps us round up the numbers as per the requirement. Number (required argument) – It is the value that we wish to round off. Significance (optional argument) – It specifies the multiple of significance to round the supplied number to. If we omit the argument, it takes the default value of 1, that is, it will round up to the nearest integer. Significance will ignore the arithmetic sign. Remember that by default, the significance argument is +1 for positive numbers and -1 for negative numbers. Mode (optional argument) – It will reverse the direction of rounding for negative numbers only. If the mode argument is equal to zero, negative numbers are rounded up towards zero. If the mode argument is equal to any other numeric value, negative numbers are rounded up away from zero. 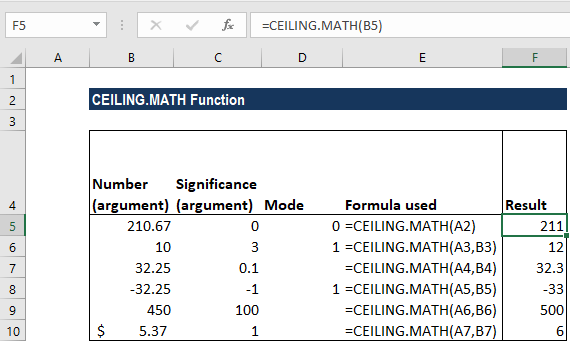 How to use the CEILING.MATH Function in Excel? 210.67 211 As the [significance] argument is omitted, it takes on the default value of 1. 10 3 1 12 The function rounds up to nearest multiple of 3. Even though mode is 1 but as the number is positive, the mode argument will not affect the result. 32.25 0.1 32.3 It rounded up away from zero. -32.25 -1 1 -33 It rounds -32.25 down (away from 0) to the nearest integer that is a multiple of 1 with a mode of 1, which reverses rounding direction away from zero. 450 100 500 It rounded up to the nearest multiple of 100. $5.37 1 6 It rounded up to the nearest multiple of 6. The items per container indicate the number of items that can be held in a container. The formula we will use is =CEILING.MATH(A2,B2). It rounds up A2 to the nearest multiple of B2 (that is items per container). The value derived will then be divided by the number of containers. For example, in the second row, =CEILING.MATH(385,24)/24, 385 will be rounded to a multiple of 24 and the result will be divided by 24. #VALUE error – Occurs when any of the arguments is non-numeric. Instead of the CEILING.MATH function, we can use the FLOOR.MATH function to round down to the nearest integer or significant figure. We can also use the MROUND function to round to a desired multiple or the ROUND to round to a specified number of digits. CEILING.MATH is actually a combination of CEILING function and the CEILING.PRECISE function.